The magnificent British ocean liner Lusitania was launched in 1907: a huge, fast, and glamorous ship. It was torpedoed and sunk by a German U-Boat on 7 May 1915. This was an act of war between belligerent Powers, and although a tactical success (it was carrying substantial war munitions as well as passengers), was a strategic disaster for Germany as it substantially influenced the major neutral Power — the United States of America — toward its entry into the Great War two years later on the Allied side. 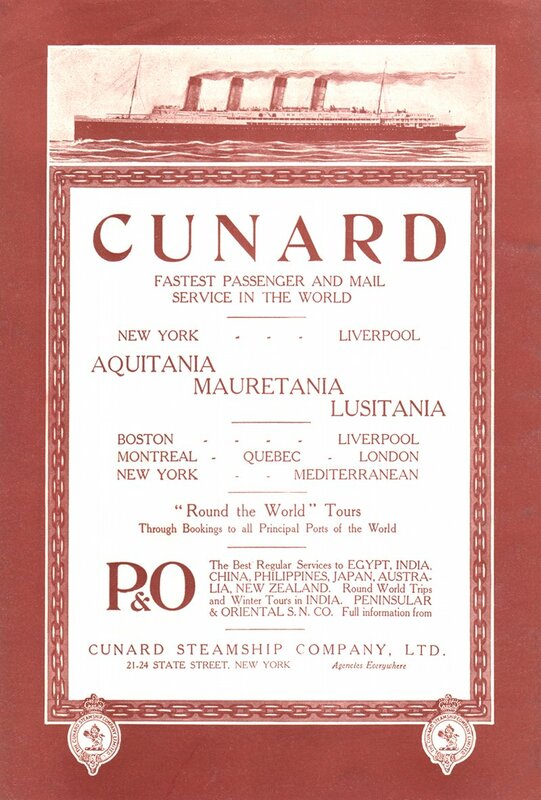 This Cunard magazine advertisement in the North American Review was probably one of the last to feature the Lusitania, before the German Embassy's warning newspaper advertisement the day the ship set sail from New York City toward Liverpool, within the declared war zone around the British Isles.